Pears are one of the best known and well-liked fruits in the world. Although they do not rank first in the United States, pears are still a delectable and desirable fruit even in this country. Their many desirable features make them popular for fresh fruit, processed fruit, and eating out of hand. As an adjunct to salads, pears have few equals. Two problems have discouraged pear production. The first is early bloom, with resulting crop loss due to late spring frosts. The second is the ravages of fire blight. This bacterial disease kills many of the more desirable pear varieties, often before the trees have become full size. The Kieffer variety is an old variety that produces a fairly reliable product. Many homes in central and eastern North Carolina have one or more Kieffer trees. This variety will generally produce some fruit every year. Although the fruit is rough and of limited dessert quality compared to Bartlett, it is still used for jams, jellies, preserves, canning, and fresh eating. Newer varieties, such as Moonglow and Magness, are somewhat more blight tolerant. Growers have reduced fire blight markedly by planting blight-tolerant varieties, applying low nitrogen fertilizer, prompt and early pruning of any blighted branches, and using antibiotic sprays. Commercial pear production is concentrated largely in California, Oregon, and Washington. North Carolina may never equal these states in total volume but pear production for home use could well be expanded. Growers have been reasonably successful in aerial spraying of water to reduce frost damage on apples when blossoms and buds are most tender. Its use on pears appears a possibility. Pears, like other tree fruits, require deep, well-drained, fertile soil with a pH of 6.0 to 6.5. Pears may grow on heavier soils and are a little more tolerant of poorer soil drainage than apples, but they still will not perform well on heavy, wet soils. A frost-free location is of prime importance. Pears bloom earlier in the spring than apples, so frost damage can be a real hazard. Not only will a site lying higher than the surrounding area provide reasonable frost protection, but it will also permit the foliage to dry quickly following dews and rains. This will reduce the severity of leaf diseases which thrive when humidity or rainfall or both occur over prolonged periods. Since the use of water for frost control has worked reasonably well on apples, a site with water available for irrigation should increase the chances of an annual crop of pears. Pear production in North Carolina is limited to a few varieties, mainly because of fire blight and frost problems. The Bartlett variety has for years been the ultimate for pear quality. The fruit is large, juicy, and highly flavored. The trees produce well under ideal conditions. Bartletts in the Raleigh area would be ready to harvest in early August. This variety is very susceptible to fire blight. If Bartlett is planted, a great deal of attention to summer pruning and chemical spraying is needed to keep the tree alive. The Kieffer is popular in eastern North Carolina. Its quality is considered somewhat inferior to Bartlett, but it produces heavily. The fruit is an attractive yellow when allowed to fully ripen, and the “grit” cells (a grainly texture) become somewhat less evident. This variety is adapted widely to North Carolina soil and climatic conditions and is more blight resistant than most other varieties grown in the state. The fruit is large and ripens in early August in the Raleigh area. As trees of the Kieffer variety age, they grow somewhat unsightly, but may remain in production for 50 years. The Moonglow variety was introduced by the U.S. Department of Agriculture. It has good eating quality (nearly as good as the Bartlett), is a good producer, and is tolerant to fire blight. This large, attractive pear ripens in mid-August (about 2 weeks after the Bartlett) in the Raleigh area. The ripened fruit is rather soft, juicy, and relatively free of “grit” cells. Trees of this variety start production in the third year. The Magness variety was introduced by the U.S. Department of Agriculture at the same time as the Moonglow. It is similar to Moonglow in fruit quality and tolerance to fire blight. It is pollen-sterile and therefore needs a variety such as Moonglow for a pollen source. The Seckel variety (commonly called “Sugar Pear”), has a very small, yellowish brown, russetted fruit of excellent flavor. The trees are very productive and somewhat blight resistant. The fruit ripens in late August in the Raleigh area. Set pear trees in early winter (usually after Thanksgiving) or in early spring. When the trees arrive from the nursery, open the package. If the roots are somewhat dry, wet them down by sprinkling immediately. If the trees are to be planted within 24 hours, put the roots in water until planting time. If the trees are to be held for over 24 hours, heel them in by making a trench and covering the roots. If a refrigerated storage is available after the roots are soaked, place the trees (with roots wrapped) in a 35-40°F storage room until planting time. Do not store trees with apples because the fruit gives off ethylene gas. For this reason, air an empty storage before storing trees. Space trees in the yard 25 feet apart in all directions. Space trees in a larger planting 12 to 15 feet apart in the row, with the rows 25 feet apart. The closer setting will accommodate 145 trees per acre, while the more distant setting will require 117 trees per acre. Dig the planting hole large enough to accommodate the entire root system without cramping. Dig the hole deep enough so tree will be 2 inches lower than it grew in the nursery. Pear trees are usually grafted. Therefore, see that the graft union is at least 2 inches above the soil line to avoid growth from the rootstock which usually voids the grafted variety. Place topsoil in the bottom of the hole and around the entire root area. Apply at least 1 gallon of water to firm the soil. Do not put any fertilizer in the planting hole since fertilizer will burn the roots. Pruning is necessary to: (1) develop a desirable tree shape, (2) maintain the tree at a desirable size, (3) make spraying for insect and disease control easier, (4) improve fruit quality by allowing better light penetration, (5) improve tree strength, and (6) encourage branching. Generally, pear trees are not pruned as much after the third year as are apple trees. Prune the newly set tree (a whip 3-5 feet tall and 1⁄2 to 5⁄8 inches in diameter) by removing the top one-third just as the buds start to swell in the early spring (Figure 2). Pruning the first growing season includes the removal of all except the terminal growth and one branch, which forms a 70-90° angle with the trunk (Figure 3). 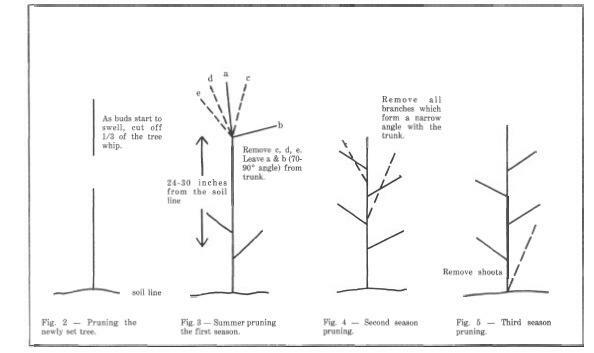 Dormant pruning after the first full year of growth includes removal of all branches which form a narrow angle with the trunk (Figure 4). Pruning through the third year should remove all developing branches with less than 70-90° trunk angles, crossing branches,and branches that are closer than 8-12 inches apart in a whorl up the trunk starting at 12 inches from the soil line (Figure 5). Pruning after the third year should be reduced to as few cuts as possible. Reduce nitrogen application to just enough to produce 2-3 inches of new growth per year. If the terminal growth exceeds that figure, omit the nitrogen entirely. Summer pruning should include prompt removal of all fire-blighted wood. Prune wood several inches below the blighted area. Removal of bloom buds prior to bloom on young trees helps to reduce fire blight. Dormant pruning should include removal of all diseased and broken branches. Cuts to reduce limb rubbing and shading are necessary. However, the cuts should be small to keep new growth to a minimum, thereby reducing the possibility of fire blight. Figures 2, 3, 4, 5. Pruning pear trees. All soil management and fertilizer applications are centered on the control of fire blight. During the first season, apply 1 pound of 10-10-10 fertilizer per tree in a band 1 foot from the tree trunk just as buds start to swell in the spring. Apply 2 pounds of 10-10-10 the second year and 3 pounds the third year. After the third year, apply only enough nitrogen fertilizer to produce 2-3 inches of growth yearly. Apply 1 pound of a 16% nitrogen fertilizer for each six trees as buds swell, if the terminal growth is less than 2-3 inches. If growth is over 2-3 inches, reduce the amount of nitrogen. If growth is only 2-3 inches, increase the amount slightly. As the tree grows larger, increase the amount of fertilizer so as to produce the 2-3 inches of growth. The major disease of pears is fire blight. Control is possible through variety selection, reduction of nitrogen fertilizer, summer pruning (when needed), and spraying with streptomycin during bloom. Varieties considered most susceptible to fire blight are Bartlett and Clapp’s Favorite. Slightly less susceptible varieties are Comice and Waite, while fairly resistant varieties are Kieffer, Moonglow, Magness, and Seckel. Summer prune all pear trees to remove all fire blight-infected spurs and shoots a week or two after petal fall and any time thereafter when infected spurs and shoots are present. Prune tree branches 6 inches beyond visible infected portion to assure removal of diseased area. Remove prunings from the orchard and destroy them. If bloom bud clusters are cut from young trees before blooms appear, the chances of fire blight affecting the many scaffold branches are reduced. Streptomycin sprays at suggested times and rate reduce fire blight infection. Fruit spot or leaf blight, fruit rots (bitter, black, and white), sooty blotch, and flyspeck can be controlled by following the suggested pear spray schedule. Scale, Codling Moth, Curculio, and plant bug are the major insects affecting pears. To control both diseases and insects affecting pear production, follow the current pear spray schedule available from your county extension office. Pears for home use could stay on the tree until they are yellow and ready to pick. This usually involves picking the fruit slightly ahead of the time for immediate consumption. A mushy ripe pear is highly undesirable. A pear increases in size as it matures. The sugar content increases and the fruit color changes from a green to a yellowish-green. The seeds of the mature fruit have turned from white to dark brown. The fruit stem separates easily from the spur. Pears ripen readily after harvest, so if you do not plan to use them immediately, keep them in refrigerated storage at 30-31°F. Ripen pears at 60-70°F before using or selling. If you follow careful storage practices, the pear-eating season can he extended for weeks for the higher quality pears and even months for a variety such as Kieffer. Trial and error will soon indicate the better storage practices to follow.